I've read that Haitian slaves were almost exclusively from Dahomey - modern day Benin. What I'd like to see is data on the Irish slaves, which predate the African ones, in the Caribbean. Some of the greatest sprinters in the world today come from the Caribbean, not Africa, and it's my theory for years that they must have picked up some mutation from the Irish slaves that made them better sprinters than native Africans. Last year it dawned on me that this could be some of the 3 known mutations leading to Hemochromatosis (Iron Overload Disorder), as they all increase iron in the blood, thus increase oxygen. Each of my parents carries a different Hemochromatosis mutation, with my father carrying HFE the more deadly one. The Irish are the population with the highest carrier rate of this mutation in the world, and most White admixture in the Caribbean and the US is actually Irish admixture. Is the link between Italian R-V88 and African R-V88 demonstrated? One of these persons belong to hg. R-V88 and very likely his place of origin was nearby Chad Lake where this hg. is most diffused also to-day. By a comparison with the R-V88 samples examined from Francalacci et al. it seems that this sample has some SNPs in common with the R-V88/M35 found so far only in Sardinia. Even though the SNPs M35 hasn't been tested, this could be a proof that the African R-V88 came from Italy (even though the paper speaks of a probable origin from Middle East as all think so far except me) could be demonstrated. The age of separation of this African line from the Sardinian one is 8500 years ago. While this information is fascinating, the title is highly misleading. Saint Martin/Sint Maarten is an island of only about 80,000 people. This study can only be used for the island of Saint Martin/Sint Maarten. Irish slaves do NOT predate African ones in the carribean. I am from the Dominican Republic, which is the first island to be formally colonized and we have had AFricans come in since 1494. In fact in 1512 there was a slave rebellion of enslaved Africans from Senengambia. I think carribeans being better runners is more of a positive selection thing, because obviously there was forced selection when slaves where bought in markets, health and physical endurance was important, so there was less "quality' control in the motherland. I think the technique will be of great interest across the Caribbean. Albeit the African source populations seem a bit sparse. The matches are a little loose, and it may be that if these guys were first generation they belong to tribes not tested but similar. STM! for example does not look Kongo or Bamoun to me. Too much peach. What are you referring to exactly? Are there any DNA studies to back up your claims? Are you aware that the average Afro-Caribbean person on most islands is actually more racially African than the average African-American? There are multiple studies to support that claim. How does any of what you are stating fit into this particular study about the AFRICAN origins of Saint Martin/Sint Maarten? The results confirms what apparentje becomes awfully clear only nowadays: that slaves were caught more inland, in predominantly islamic territories away from the slave ports along the coast. Western slavers never caught slaves, they bought them and sold them. Enslaving by then was an inland affair. What you referring to? The Irish and others in the Caribbean is well documented (albeit it has a tendency to be ignored). Even today many of the Caribbean accents have the twang of rural England and Ireland. And it wasnt just men, many women were transported also. The stuff about running is I think Mr Conroys original idea. This paper might be relevant here. It shows European admixture running at a little over 10% in Jamaica, St Thomas and Barbados. Surprisingly it was highest in Jamaica. This is in folk who identify as AfroCaribbean so in reality it would be even higher overall. And I expect higher still in paler islanders like Montserrat, which had a big Irish population. ancestry (3.2% ± 3.1). St. Thomas, USVI had ancestry levels quite similar to African Americans in continental U.S.
(86.8% ± 2.2 West African, 10.6% ± 2.3 European, and 2.6% ± 2.1 Native American). " Nice article! I would think that since Jamaica has at least 5 major group representations from West or Central Africa, it would have been better to see the actual % of haplogroup distributin within those 'groups'. ST Martin's African descended population is rather small when compared to Bahamas, USVI, Jamaica or even Dominica, which has a long standing Carib presence. There should be nothing surprising about the results of that study you posted. Anyone who follows populations genetics knows that Afro-Caribbean people are generally "purer"/less admixed than African-Americans. Jamaica is a relatively large, mountainous Caribbean island with a long history of maroons who lack much/any admixture. Also, Montserrat has a population of only 4,900. To put this in perspective, it has less people than the smallest, official town in Belize (which is Punta Gorda). I thank Dienekes for his blog and for giving me a chance to comment from time to time, as the odd man out, the engineer with a problem solving, question trouble shooting approach. This paper, that I had first dismissed, is the most interesting piece I ever found in this blog, regrading my own questions. "shed new light on long-standing historical questions" resounded like poetry in my mind, and resonated into my behavioural, sociological, anthropological, political and economic questions. I will post several comments in here, as I have little free time. Why am I into this? I will answer with one of my questions: why a we, the people of Monterrey, Mexico, that descend from the founders, so usually inclined and or endowed for globalization, vis a vis other Mexicans, Latin Americans and even Iberians? Foor some it would be easy to answer, because you descend from old Conversos, your Jewis culture is present 500 years later. But that is not the whole story, I do not care much about my genetics (married to a non particing MD geneticist, I am coauthor in a genetics paper) I care about our whole mix, and that means other Low Andalucia, Portuguese, Basque, Burgos an Navarre, Genoese, Dutch perhaps, black African and native American, people. My tentative answer is: because we descend from the people that devised the idea of globalization, perhaps from 600 years ago, in 1415 Ceuta taken by the Portuguese. This will sound as a call for "Simpathy for the Devil" it is as stated as Professor Francisco Bethencourt (University College London) states that the driving force in America was CONTRABAND (SILVER AND GOLD AND OTHER) AND SLAVE TRADE. Yes trade started it all but the devil was behind all that. 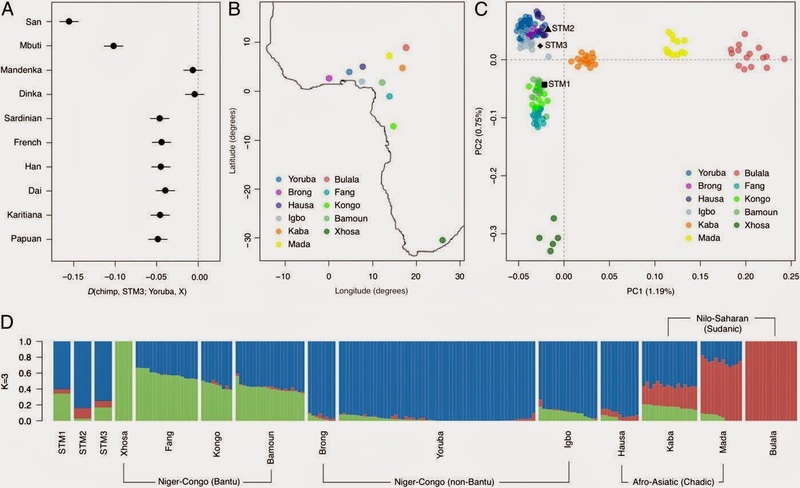 What is described in this paper and your comments circles around the genetics of the old Rios de Guinea's black slaves (hope UCL's Dr. Toby Green was in this blog). Look for the same sort of genetics in Madeira, Azores and Canary Islands, low Andalucia and Portugal, America, and after 1580 Northern Mexico, Rio de la Plata region in South America, Cartagena in Colombia. Devils, it is in the nature of their old game (Who who, who who). Black people is having their history being told. It is the history of those that brought them here that is starting to be told. Understanding all that would help understand the America's history. Those are the strangest beach reads last Holy Week in Can Cun. If anyone wants to pursue the matters dealt in this article Toby's is a must read. He deals geography, history, anthropology and sociology and, in a way behavioural sciences. DNA science in there is just being born and will become a great tool for the advancement of the black people's forced diasporas. He even deals in social systems and social ecosystems. It is important to me as I (say with cowboy ancestry) follow cattle rising; as he deals with ecosystems were Tse Tse mosquito is scarce. Therefore, cattle can survive. I am beginning to detect some patterns in there, many similitudes with northern Nueva España, later Mexico. And, as I said, the ancestry of our traders and slave traders as well as African DNA is depicted all over there. I see early African Slave trade in there as dealing with more socially evolved, civilized colored people. Say western equatorial and North of equator people, which in later stages moved south to Angola and farther, as Mozambique. That would explain why a colored slave would fetch as much as trice as much as a wild Native (North) American slave in here. And how they tended to move into less force intensive jobs even to manage households and how they merged into our melting pot. So much that its existence is noticed only by DNA testing, tough it was described in old censuses (say 1821's last done by Spaniards with caste divisions).